Woodland walks and wildlife ponds at Balloch Wood. The plan for Balloch Wood is to provide a network of walks extending outwards into the local hills from the village. 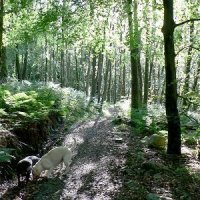 At present four main trails cover the length of the woodland and follow routes that have been walked by the local community for more than a century, following the natural contours of the woodland and using materials either from the woodland itself or from the most sympathetic local source. All routes are waymarked from the village square and provide access to the main points of interest and features including the poetry stone circle, the waterfalls and gorge of Balloch Burn, red squirrel feeding sites, an ancient chalybeate well, the wildlife ponds and roundhouse interpretation centre and areas of broadleaf woodland. However, for the more intrepid walker keen to explore off the beaten path, a wide range of other discoveries await you. The Burnside Trail is a 2 mile circular route, full of features and points of interest, which starts at Kirkmabreck Church, on the edge of Creetown Village, and follows the Balloch Burn upstream as far as Cardoon Bridge before returning through larch woods along the Larch Trail back to the Church. The larch trail return route alternatively provides easier access through the forest for the less able. 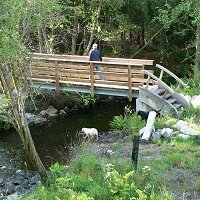 The Burnside / Larch trails can also be extended for a further 1.5 miles, in both directions, by continuing from the Cardoon Bridge on the Pond Trail which meanders through ancient woods before reaching the Garrochar wildlife ponds. Parking is also available at the wildlife ponds so walkers can also start the route from this end. An all abilities trail has been built providing a circular route around the wildlife ponds, enabling visitors to enjoy the wide range of pond life at close quarters. A range of broadleaf trees, have recently been planted in this area and provide a contrast with the ancient woodland surroundings. The Oak Trail begins across the road from the wildlife ponds, crosses the recently built Darach Bridge and runs in a loop through broadleaf woodland as far as the kissing gate on the Glenquicken Road. On the upper trail of the loop views open out over the local hills while on the lower trail one gets a true sense of the nature of the deciduous woodland.